I know our wedding is gone and done, and I don't mean to run it into the ground by talking about it too much. However, a lot of folks are new to the site, and I thought a little postcard series might be a fun way to revisit some aspects of our wedding (with new details, I promise). 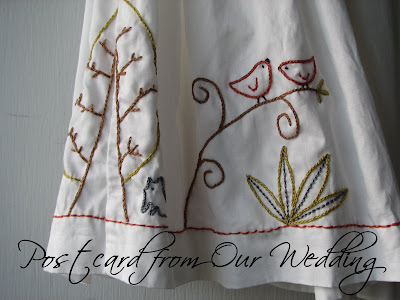 This first postcard features a small portion of my wedding dress. The $15 dress came from Target online and arrived at our house in a very small box. It wasn't my ideal dress. It made my body look bigger than it is, and it came from a mass-market box store. But for $15, I didn't think I would be able to find something better. And, frankly, I was tired of shopping for a dress. I know there are plenty of people who enjoy scouring ebay and vintage stores and sewing patterns and Etsy. I like doing those things, too; it's just that I can only take a couple weeks of it before I am ready to move onto something else. Also, my wedding dress shopping phase came before I truly started to feel pressure from the cool, DIY-to-the-max, I-took-a-letterpresss-class-to-make-my-invitations weddings in the alternative blogosphere. If I had been addicted to a lot of wedding blogs at that time (like I am now), I would have felt even more pressure to find The Perfect Dress that would make readers ooh and ahh. As it was, we had a lot of things on our wedding to-do list. I was eager to get the dress crossed off. Make a sash to reign in some of the extra fabric. Since I wanted to keep the cost as low as possible and minimize our environmental impact, I decided to use fabric from an old dress that I no longer wore. The dress had special meaning because I got it during my trip to India, which took place right after I met Matt for the first time. We never decided on "wedding colors"; they just sort of emerged from that old dress. That's when I got the idea that I could make a tie for Matt out of the same fabric as a metaphor for unity (and, later, when our wedding planning stretched on too long and I had some spare time on my hands, I decided to make Hoss a matching bandanna and make flower pins for the wedding party with the last remaining scraps (and then put the tiniest remnants into our wedding quilt). I didn't feel pressured to undertake these projects; I wanted to. Embroider along the bottom. I figured we had to do something to make the $15 dress quasi-special. At times, I did feel some pressure to make our wedding special with heart and sincerity, since we weren't doing it with money. That's when we came up with the idea to embroider our life story together along the bottom. I have fond memories of sketching out the design with Matt in our tiny craft room in Denver. Then I spent hours embroidering the design, usually while talking with friends on the phone. 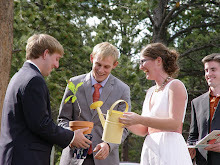 It was a calming and grounding experience, and it made me feel like I was putting myself into our wedding. Plus, I learned a new skill. Ask a seamstress friend to modify the back to make it more attractive. We brought pizza to her house and spent the evening hanging out with her family while she worked on my dress. 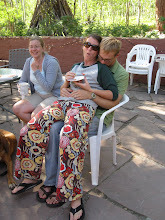 It was our first communal wedding planning experience, and it felt good. I had a lot of doubts about the dress going into the wedding. Mainly, I was afraid I wouldn't feel beautiful and confident on my wedding day. I was already nervous about being the total center of attention for such an extended amount of time. If I had to do it all over again, I think I would have the courage to ditch the concept of a white wedding dress and instead go for something that I would wear again and again (for a lifetime of parties). Since our wedding was offbeat in many ways, I think I clung to a few traditional things in order to prevent total discombobulation. I would definitely prioritize comfort. I think being able to walk and dance without constant adjustment or fear of toppling over is a must in my book. But that's just me and my priorities. I would also try not to stress about it so much. Looking back on it now, the dress really doesn't deserve as much attention as it gets. After time, the details fade. I know it's shallow and unimportant but it's a shame no one told you the dress was pretty. Because it was, and you looked pretty in it. i think she looked pretty and her figure looked great in it, too! YAY for the sash idea! she just looked so natural and happy that she exuded a bridal glow. Ooh I love it! Not to get ahead or be too bold, but if and when you decide to have a little one, you should definitely figure out a way to add some more embroidery to it and convert it to a blanket. I really see this as an heirloom piece. it surprises me that you didn't get bombarded with compliments on it - i was so smitten with your dress i sent your website to dozens of my friends because of your straight awesomeness. even though your choices were practical...i think they were brave too. i love that societal norms can be altered to fit personalities and circumstances...if we are open to doing them. i hate to admit it, but i feel the pressure to be a beautiful bride in a lovely white dress...with a freaking veil (this veil thing is rather new to me) and yet i don't think it's because i really care what other people think, it's based on what I want. Oh well. My $50 JCrew dress will do. Details do fade. I've been married for 5 months now and am finally feeling confident about my dress and offbeat wedding. I wanted a white dress, but something simple and made by my seamstress friend. I chose a pattern and fabric and she made a fabulous dress and veil that I loved. It was comfortable and beautiful to me, our immediate families, and my partner; however, I received no comments (about my dress or any aspect of my very practical, DIY, low budget wedding) from my "Wedding Industrial Complex" family and peers. This hurt and negatively impacted my reflections of our perfect day. I wouldn't change a thing about our day, but was still impacted by the lack of comments (good or bad) from others. I have to agree with everyone else, your dress was amazing and I'm jealous that I won't have the opportunity to something similar because the fabric of my dress won't hold up to embroidery. I think the lack of compliments is made up for the fact that your dress provided so much else to you: community experience, an entirely personalized design which you made with Matt, the incorporation of the fabric elsewhere (especially in the quilt which you'll have forever) and knowing that saving on things like your dress allowed you to purchase a house. I think you should be really proud of those things. If I had a nickel for every time I've heard "but, it's THE dress, I have to splurge on it", I could buy one of those gowns people obsess over for months, haha. i thought your dress was fabulous and loved how personal it was - better than any $5,000 gown! Your gorgeous dress was the inspiration for my wedding dress because I it so much! I found my dress on the clearance rack at Nordstrom, though I got rolled by a $60 price tag (more than I wanted to spend but I loved it!)... the fabric was too flimsy for embroidery, but my mom did a great job tailoring it to fit the night before the ceremony! It's now sitting in my closet waiting for spring, when I plan to dye it for reuse. oops, meant to say "because I loved it so much!" I really loved your dress and must say it inspired me to follow my own(different) dreams as well. However, I experienced a similar reaction - I did not receive a great deal of compliments on my dress (sewn by my mom and in a sage green) and especially felt pointed looks/opinions from WIC family & friends. I feel conflicted because I don't want to care about the WIC family & friends opinions... but you do. as time goes by though (it's been about 5 months) it becomes more and more precious to me that I held strong and did what I wanted anyway. Thank you for being such an inspiration! Thanks so much for the honesty in these posts and comments. I have to admit I'm surprised that people wouldn't comment about how lovely a bride looks, even if it's not a standard WIC dress. I'm still in the very beginning of the wedding planning process and haven't started looking at dresses. But over the last couple of weeks I've started thinking about my family and I sewing a dress (more emphasis on the family than me part as I still don't know how to sew...but I want to learn!) and though I don't want to admit, am not looking forward to a negative reaction. Of course, no matter what I do it probably will not be a big WIC dress as I can't see myself doing more than going with a bridesmaid dress in white or ivory. Oh well. I think your dress is gorgeous. I'm shocked that not many people would compliment you- they should be complimenting not on the dress but how beautiful you look in it. It's a shame that our perceptions of ourselves are so affected by other people's opinions. It's so sad to hear that people feel negatively about aspects of their wedding due only to other people's lack of compliments/praise. And I'm not excluding myself from this bad habit! I would likely be disappointed if my friends and family didn't complement me on my dress. It reminds me of being complemented by a stranger in a store while trying on clothes. It seems as though those comments are so lasting. My mother always used to tell me some phrase about being able to save time, money, or energy, but you can't choose all three. Being eco-friendly, DIY, thrifty, original, creative, independent,WIC-approved, family-approved, timely, super stylish and comfortable are impossible for most people. A compromise must be met somewhere. You did exactly what seemed appropriate at that time. Personally, I found your dress charming and perfect for the setting. I am amazed at your patience and skill with embroidery. As I am currently favoring a less than traditional route for a wedding dress, I must ask if you have ever worn again? I went through the exact same feelings you describe. The dress was the first thing I looked for to take the pressure off shopping, and to find something very reasonable. I ended up purchasing one of the first things that caught my eye. It was on clearance and online, and not advertised as a wedding gown (it is ivory in color), and way under the budget I had set for myself $100), and when it arrived fit perfectly and what a relief to not have to go dress shopping or have pressure from friends and family to spend money on something that would take away from the resources I have to pamper my friends and family...and truly enjoy the day with them. I applaud you and the details you added to the dress - they are truly beautiful - something you can definitely share with future generations. I just got married on the 30th of October and stumbled onto your site about 2 weeks before the big day. I was hoping you might like to feature our wedding sometime. We had a wonderful, memorable Halloween themed wedding that everyone enjoyed. I purchased a BLACK dress from TJ Maxx for $40 that I also took on my honeymoon with me. 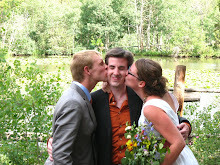 We had a private ceremony in front of the barn by my mother's house. My father is buried in the cemetery across the road from her, so he was able to give me away in spirit. My cousin is a preacher and he married us for free. Our friend is going to photography school and looking to build her portfolio. She took over 400 pictures which she loaded onto CDs for a cost of $100 and we have full copyright release. My aunt made our wedding cake for free and it was a smash. I would love to send you pictures of it. Had we had a professional do it, it would have been a $300 dollar cake. We rented the Grange by my mom's house for $50, which my mom paid for. For food, we did spaghetti and meatballs with salad and bread. My aunt bought the food at Sam's Club for under $75. It fed the over 50+ people we had at the reception. Decorations came from Halloween markdown sales and the dollar store. My aunt and mom decorated and everyone commented on how wonderful it looked. My husband bought an orange shirt on clearance at Penny's for $15, a vest for $19, pants for $20 and shoes for $20. He also took them to the honeymoon. Rings were the most expensive. His was 99 dollars. Mine was on sale and then there was a additional 20% of them for a grand cost of $300 for the engagement and wedding band set. Our big splurge was on the silk flower arrangement in fall colors for $50 that I can keep and treasure. The matching boutonniere was included in the price as well. For favors, I found a 12 pack of black and orange candles on clearance at Michaels for 2.99. I bought several and then ordered some $3.00 labels on Ebay that had our names and the date and attached onto the candles. They were a hit!!! All told, we spent under $400 on everything. 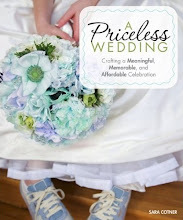 So yes, you CAN have a beautiful wedding and keep it inexpensive! !